Pure survival are often words used by parents when describing a particular decision made at a given time involving their kids. It's not always pretty, it just happens to be at that specific time and in that place. And “it” may never happen again. That ranges from taking kids to creative spots when they've gotta go! Or getting an underage, yet older sibling to take care of younger brothers or sisters, in a pinch. Or in the case of one mom — lightning her load — literally. During a candid conversation with several parents recently, a single mom of four revealed that when one of her kids was in his teens, 14 or so, that she taught him how to do laundry. Everyone looked at her in utter shock? A 14-year-old doing laundry? She must have been speaking in another language. She went on to explain that juggling a job, 4 kids, a household and life, she had to divide and conquer chores and duties. Pure survival for her meant teaching her teenage son how to wash the family's clothes. Why is that such a foreign concept? It's not like doing laundry takes superhuman skill and intellect. Was it his age or the fact that he was a boy that left everyone so bemused. Is it not a life skill that he will need to know one day? Funnily enough the laundry lesson came up in another conversation with several parents this week. This time a mom of two girls mentioned that she taught her kids how to do their laundry around 12 or 13 years of age. Brilliant, simply brilliant! Kudos to those parents for resisting the urge to do things that kids can do for themselves. Sorting, soap, a couple of buttons and they're off. No biggie. The biggie is what they are learning through the laundry task. 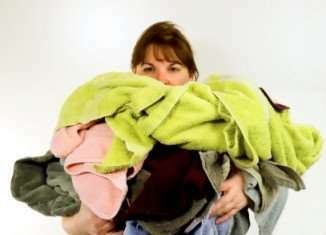 That there is a process to cleaning clothes — one that involves time, organization, effort. That dirtying clothes have a consequence at one point that must be dealt with. That if they are down to their last underwear, there is hope. A solution is not too far off. If teaching laundry skills 101 is too big a leap, then baby steps make sense. Sorting, folding and delivering clothes to their rightful owners are tasks kids as young as 2 or 3 can participate in without too much supervision. Who knows, it may just be what the doctor ordered to nip the 'clothes all over the room and on the floor' crisis that many of us parents face. And in tandem, it makes sense for parents who insist on doing everything themselves, denying kids the opportunity to think, act and take care of themselves. Here's to laundry life lessons!